1. The death toll rose to 29 in the Camp fire, tying the state record for the most people killed in a blaze, and that number could rise further because more than 200 people remain missing in the wildfire that destroyed the town of Paradise, the Sacramento Bee$ reports. Overnight, the fire spread to 113,000 acres as firefighters were able to reach 25 percent containment on the blaze. 2. In Southern California, strong winds today threaten to spread the Woolsey fire, which has destroyed an estimated 370 structures, including homes owned by entertainment industry stars Miley Cyrus, Neil Young, and Gerard Butler, the Sacramento Bee$ reports. The big blaze, which straddles Ventura and Los Angeles counties, has torched more than 90,000 acres. 3. 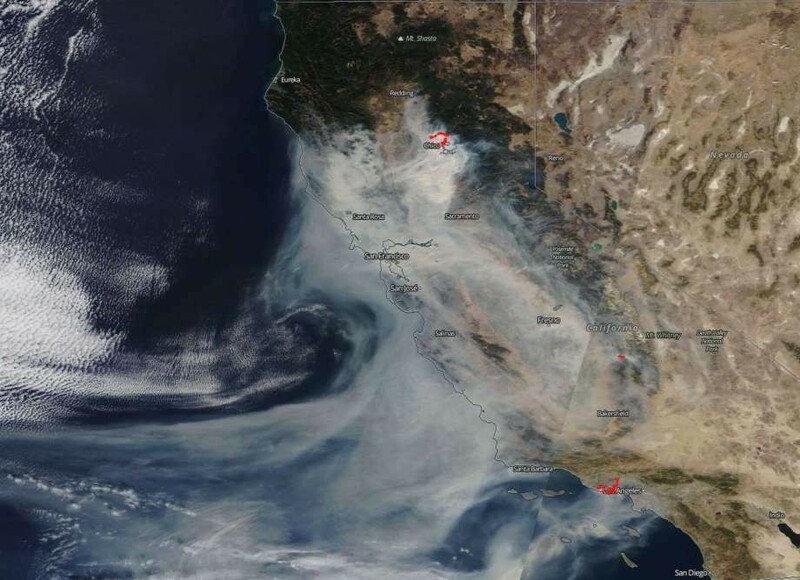 Air quality in the Bay Area and throughout much of Northern California is expected to remain horrible until at least Wednesday, as health experts continue to advise residents to stay indoors, especially people with health problems, the elderly, and young children, the Bay Area News Group$ reports. 4. The city of Oakland has terminated its contract with controversial developer Phil Tagami, who has pushed to build a coal terminal at the former Army base, reports David DeBolt of the East Bay Times$. The city, which has tried to block Tagami’s coal plan, maintains that his overall project at the base has repeatedly missed deadlines and that he has effectively defaulted on the development. 5. As mail-in and provisional ballots continue to be counted around the nation, Democrats are now forecast to pick up 38 seats in the U.S. House of Representatives, according to FiveThirtyEight. Republicans, however, are expected to gain two seats in the U.S. Senate. 7. And Robert “Bob” Stinnett, a prize-winning longtime photojournalist for the Oakland Tribune, has died at the age of 94.